Perhaps one of the most common problems in every household falls into nothing but storage. And when you think that your storage ideas may be out of hand, think again! That’s because the Suncast Deck Box Mocha Wicker Resin, might be your next best friend. The Suncast Deck Box is ideal for storage. Your garden houses so many items, including gardening tools, fertilizers and even seedlings. At the same time, your patio may also host other important items like your favorite outdoor umbrella, pillow cushions and others. 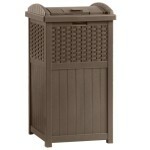 One ideal way to keep them all in place is with the Suncast Deck Box Mocha Wicker made from Resin. This is an attractive storage idea perfect to fit your style or any outdoor setting. With it’s durable material, you can sit on it and store just about anything. Made of highly durable resin, this is one great storage box that matches your mocha hose reel, also from Suncast. It has a small area for a padlock that also gives you a peace of mind, as you try and keep away the kids from items that may harm them. Lightweight yet durable, the Suncast Deck Box in Mocha Wicker can host up to 99-gallon in capacity and measures 50″ w X 25.5″ d X 25.5″ h. While the inside measures about 22″ W x 22″ D.
Moving the box from one place to another is never a problem because it has a design that includes strong handles on each end and it has a dry design. You can be sure all you put inside stays dry always. Strong enough, you can readily sit on it too. The price is reasonable and with given discounts from stores, you can get your money’s worth.